I’d love to have eavesdropped onThursday’s meeting in Berlin between Wolfgang Schäuble, the German Finance Minister, and Yanis Varoufakis, his counterpart in the new left-wing government of Greece. For years now, Schäuble has been relishing his role as Europe’s Andrew Mellon, a conservative bogeyman who fiercely opposes any departure from austerity policies. Varoufakis, an academic economist and blogger who took office after the Syriza Party’s win in last week’s election, is flying around the continent demanding a major debt restructuring and an escape from austerity for his troubled nation. 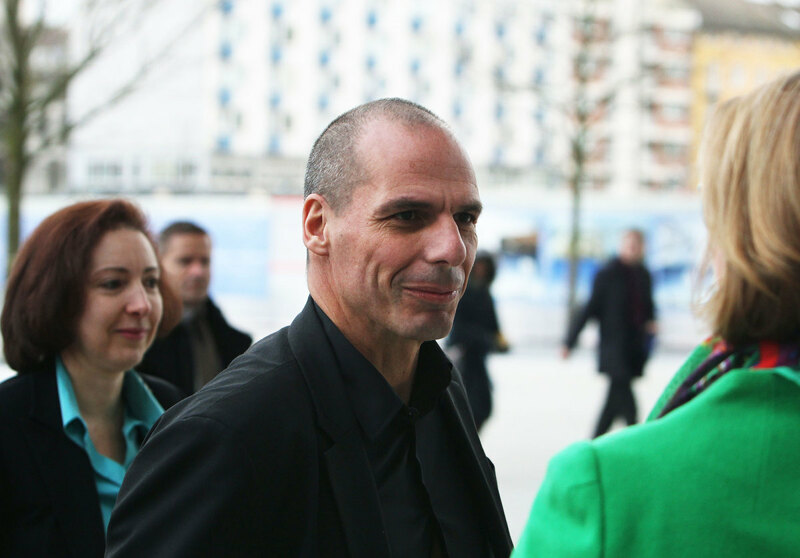 For his encounter with Schäuble, Varoufakis chose an electric-blue shirt. Evidently, they avoided fisticuffs. At a press conference afterward, Schäuble said that they had “agreed to disagree” about the steps Greece needed to take. Varoufakis contradicted him, saying, “We did not reach agreement because it was never on the cards that we would. We agreed to enter into deliberations as partners.” Those deliberations became far more loaded when, just hours before the meeting began, the European Central Bank, in an unexpectedly aggressive move, said that it would no longer accept junk-rated Greek bonds as collateral for credit, citing the new government’s threat to abandon the terms of its existing bailout. Since many of Greece’s troubled banks depend on the E.C.B. for day-to-day financing, the central bank’s announcement escalated tensions and raised the prospect of an all-out crisis, should Varoufakis and his boss, Prime Minister Alexis Tsipras, refuse to change course. With analysts openly discussing the possibility of a run on Greek banks and the delightful contraction “Grexit” making a comeback, it is perfectly possible that everything will go to hell. But before you dig out the bag of drachmas you kept after your student trip around Europe, or call your broker to see if it’s possible to short the stock of Piraeus Bank or the National Bank of Greece, it’s worth taking a breath. Despite the drama of the past twenty-four hours, the chances that Greece and its euro-zone partners will eventually reach a deal are well above fifty-fifty. The process will take months, and there will be more alarms along the way—during talks over a debt restructuring, that’s almost always the pattern. But the potential costs to both sides of failing to reach an agreement are so huge that, in all likelihood, neither will allow it to happen. Let’s take Greece first. It’s not exactly news that the government in Athens wants to escape from a bailout that has forced it to slash spending, lay off large numbers of public-sector workers, and watch the nation’s unemployment rate soar to about twenty-five per cent. Last October, Antonio Samaras, who served as Prime Minister from 2012 until a couple of weeks ago, told the International Monetary Fund that his country intended to leave the bailout program early. The question has always been whether this was practical. The I.M.F. insists that even if Greece managed to repay its existing loans to the fund, the country would still need backup financing, which would involve continued international supervision of its policies. During the election campaign, Syriza accused the Samaras government of kowtowing to the “troika” of Greek creditors—the I.M.F., the European Commission, and the E.C.B.—and pledged to abandon the existing framework and present a new debt-restructuring initiative directly to other European governments. Earlier this week, Varoufakis provided a broad outline of Syriza’s plan, in which Greece would issue many billions of dollars’ worth of new bonds and use the proceeds to retire many of the old ones. But he has refused to be more specific, saying that this is not the time for a lecture in financial engineering. If the E.C.B. were to stand aside completely, there would almost certainly be a run on the Greek financial sector, and Syriza’s only option would be to order the Greek central bank to print money and rescue the commercial banks. This would entail exiting the euro zone. However, Varoufakis and Tsipras have already made clear that that’s not their desired outcome, and it isn’t something that the Greek public would countenance, either. Despite the popular resentment in Greece toward the bailout, and toward the Germans, most Greeks want to stay in the monetary union. That’s clear in the polling data, and it implies that Syriza, despite its initial bluster, will have to show some flexibility. In the short term, this will probably involve agreeing to some sort of external supervision during the debt negotiations, perhaps without the explicit involvement of the I.M.F., which Syriza, with some justification, blames for the harsh terms of the 2010 and 2012 bailouts. Ultimately, Varoufakis and Tsipras may well have to compromise, giving up some of their demands from the election campaign. But as long as an eventual agreement involves Greece escaping the clutches of the troika, regaining some policy sovereignty, and seeing its debts reduced, logic suggests that Syriza would consent to it. What about Greece’s creditors? Surely, Germany and the rest of Greece’s debtors won’t sign onto such a deal. Actually, they might well do so. For one thing, there is widespread recognition that Greece has already made herculean efforts to improve the state of its public finances, and that its current debt burden isn’t sustainable. Even the I.M.F. acknowledges some of this. A few years ago, the Greek budget deficit was more than fifteen per cent of G.D.P. Now the Greek government is running a primary surplus, which means that it is covering all of its bills except debt interest. “There’s no doubt that in absolute terms, both in terms of the fiscal adjustment that’s been undertaken and the financial reforms that have been undertaken, Greece has probably done more than anybody,” Poul Thomsen, the head of the I.M.F.’s European Department, said at a press conference not so long ago. Despite all the cuts it has made, however, Greece is still lumbering under about three hundred billion dollars’ worth of debts, which is equivalent to about a hundred and seventy five per cent of the country’s G.D.P. The sum is so large that there is little prospect of it ever being repaid in full. At the end of similar episodes in history, such as the Latin American debt crisis of the nineteen-eighties, the problem of chronic over-indebtedness was only resolved when creditors accepted a deal that abrogated a portion of the outstanding loans. That’s why most experts, even German ones, regard some sort of “haircut” as inevitable in the Greek case. Indeed, the stumbling block isn’t really the principle of haircuts; it’s how they would be structured, or disguised, and whether they should be extended to other bailed-out countries that have taken the austerity medicine, such as Ireland and Portugal. The European authorities, understandably enough, want to maintain some control of the process. The Germans, in particular, are insistent that Greece live up to its promises to reform its economy by, for example, keeping its budget deficit under control, privatizing public companies, and opening up protected industries to international competition. The previous government in Greece, despite all the progress it made in cutting the budget deficit, moved much more slowly in introducing structural reforms that would have hurt some powerful vested interests. Doubtless, Germany and its allies will seek to force a hard bargain. In the end, though, they don’t want to see Greece crashing out of the euro zone. The whole point of monetary unions is that they are supposed to be irreversible. If Greece were to exit and its banks default, it would set an alarming precedent. “In every future crisis, the question would be whether this was the ‘exit moment,’ ” the FT’s Martin Wolf astutely noted last week. “Chronic instability would be the result.” And Germany, despite the occasional grumbles from some elements in Berlin, doesn’t want to see the euro destabilized or destroyed. Being the leader of a currency union with nineteen members makes German industry more competitive, and the country more prosperous and influential. In short, there still is room for a deal that benefits Greece and the rest of Europe, Germany included. Why, then, didn’t Schäuble and Varoufakis sit down and work out its main elements on the back of a napkin? Partly because the issue of interim financing and the role of the E.C.B. need to be resolved first. Partly because each side thinks it will get a better deal by playing a longer game. And partly because the leaders of Syriza and the euro zone both need to persuade their supporters that they didn’t give in too easily. So, this thing will go on for while. As long as reason prevails, though, it will surely be settled eventually.